Mill-Max adds 2mm pitch products to our family of shrouded male pin connectors for higher density applications. Like our .100" pitch series, these connectors are effective where a robust, secure connection is demanded, such as frequently mated interconnects and blind mate situations. 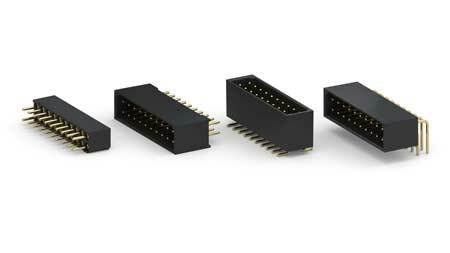 These double row connectors come in 4 to 100 pin configurations and are available in through-hole solder tail, right-angle and surface mount termination styles. The shroud of the connector extends above the pins affording full protection during handling, assembly, connecting and disconnecting. Further, the shroud limits the amount of misalignment between connectors during mating and de-mating, acting as a guide for blind mate applications. Mill-Max also offers a mating socket, which is keyed to provide a polarized connector pair when mated with any of the shrouded headers. The three termination styles offer through-hole and surface mount options to address a variety of applications such as: vertical board-to-board, perpendicular board-to-board and cable- (via flex circuit) to- board. All three connectors are dual row with 2mm spacing pin-to-pin and row-to-row. The connector body is molded from Ryton, a high temperature, durable thermoplastic with excellent thermal stability, chemical resistance and a flammability rating of UL94 V-0. The pins are made of precision-machined brass and are gold-plated to provide a secure and reliable connection. The socket receptacles are also precision-machined and fitted with Mill-Max's high reliability contact; both components are gold-plated. These connectors are RoHS compliant and suitable for lead-free reflow processes.